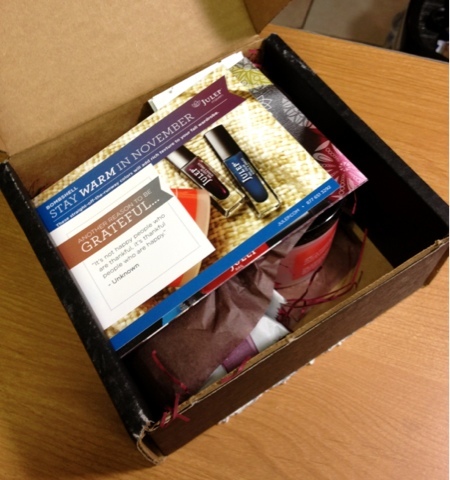 That's right my November Julep box has arrived! I am a bombshell maven so Julep ships me out my own individualized box of polish and product each month for a monthly subscription price. Here's what was in my box upon first glimpse. Julep always does an awesome job decorating their boxes. There are a few cards on top with the products all cutely placed and packaged underneath. Usually there are two cards included in each package. 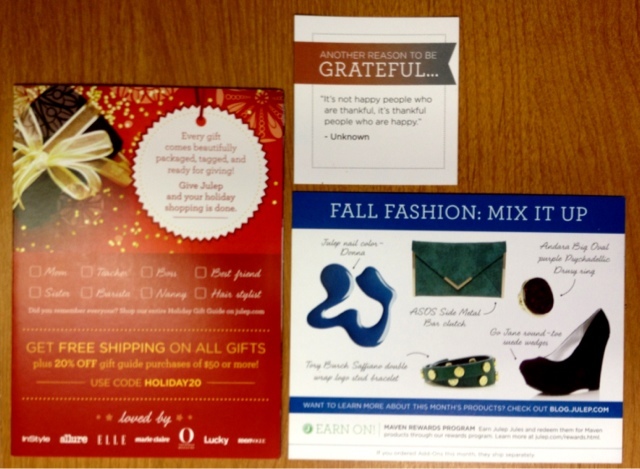 One detailing each product included in the package and a smaller card with a cute quote on the card. This month they've included a holiday shopping catalogue. Novembers quote is: "It's not happy people who are thankful, it's thankful people who are happy." - Unknown. On the pack of the product card is a cute fashion guide to help you accessorize with your polish colors for the month. The products are lightly wrapped in a mauve tissue paper which hides an envelope wrapped with an purple ribbon. Here are all my products unboxed. I got Julep Donna, a smokey peacock blue creme and Trina, a deep aubergine shimmer, Juleps Pink Grapefruit Body Frosting and three one-step polish remover pads. The pink grapefruit body frosting is a cotton candy pink, grapefruit fragranced moisturizing lotion. This lotion is infused with shea butter, aloe vera, vitamin E and natural oils to sooth dry skin. It goes on very light and fragrant. I love that I got this product because my skin does tend to dry out as soon as the weather starts getting dry and cold! Thanks Julep! Onto the polish! My colors were Donna and Trina this month. 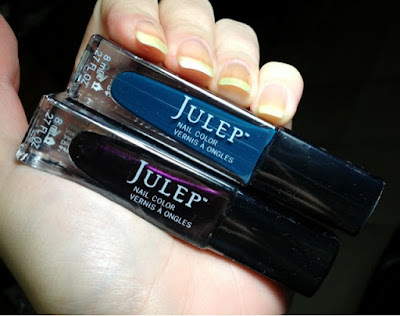 Julep sent out suede polishes this month which tend to dry slightly matte. The bombshell box included a creme and a shimmer instead which I prefer over the sudes. I started off by swatching Trina. Trina is practically a one coater! I did a second just for good measure. 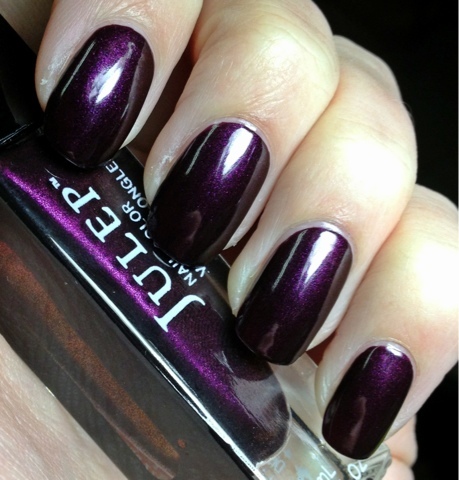 The polish applied beautifully and the light purple shimmer is absolutely gorgeous. This polish has a very shiny finish. This may be one of my favorite Julep polishes ever. I am very impressed! Just for good measure here is a macro shot of Trina. Make sure you check out those shimmery flakes. Donna is a gorgeous blue creme. 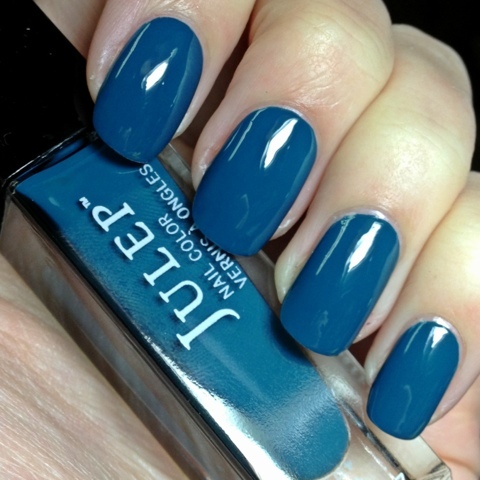 I love blues, they tend to be my favorite polishes. Donna is no exception! This is a two coater with an awesome consistency. The blue is one of my favorite shades. 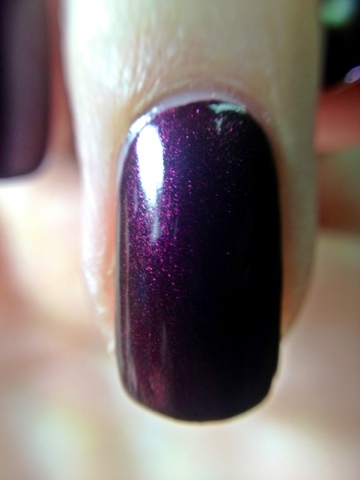 This polish also has a very shiny finish. So Donna isn't left out, here is a macro! I LOVED my Julep box this month! Both colors are polishes I will wear often and they both had great consistencies. I love the Grapefruit Body Frosting as well! It is a good amount I will be able to use through the fall and all winter to keep my skin hydrated. If you are interested in trying Julep as a subscription I have a great deal for you. You can try your first Julep box for just 1 cent. If you love it you can keep your subscription for $19.99 a month after that or if you aren't interested, you can keep your 1 cent box and cancel without penalty. To get your 1 cent box just go to Julep using the link, click on 'become a style maven' and take their style quiz. 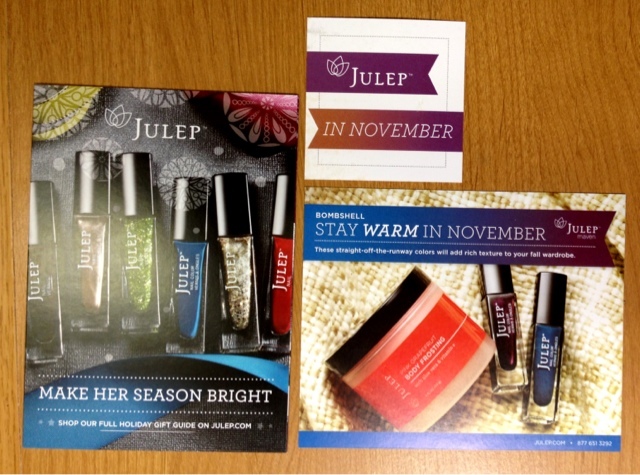 Use the code JULEPVIP upon checkout and you will get your first intro box for only 1 cent. I love Julep because they work so well with their customers. If you don't have the cash to get your box for the month, no problem you can skip for no charge. Don't like your style box for the month? No problem, they will let you change it to any other styles available for the month between the 20th and the 24th of each month. If you decide to sign up for a 1 cent box, let me know what style you got! What awesome colors!! I'm so jealous! I love the blue the most! Try the donna with a matte finish... I love it! !